Its Day Seven of OSR Christmas. Before we get to today's festivities, let's find out who is the recipient of yesterday's awesome gift. Charlie Mason - congrats. Email me at tenkarsDOTtavern and we'll get you hooked up. Now for today's gift. 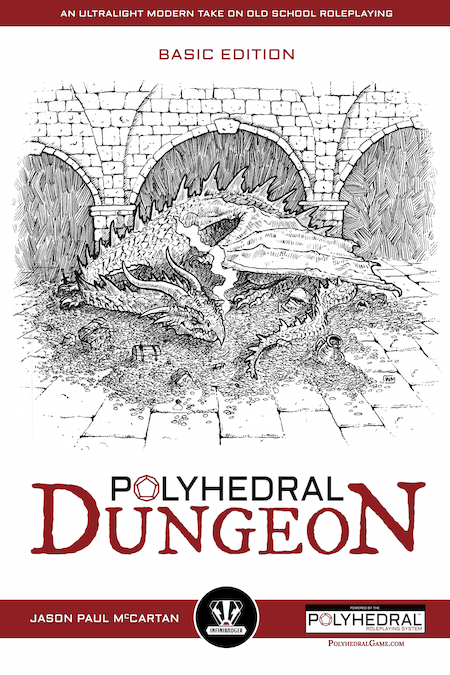 We are giving away the Polyhedral Dungeon (Color Print + PDF). Polyhedral Dungeon is an OSR inspired system that even I grok. Its well written and the rules quickly step aside. Congrats to Charlie Mason, one of the people whose name I recognize from Tavern Chat. Excellent! Sounds nifty. Sign me up! Sounds great for the little ones. Tosses some dice for good luck. I like polyhedrals and dungeons, so count me in. Always fun to check out a new game. Had my eye on this. Hope this is my lucky day. I'm interested in checking this out! For all the good things I've heard about this system, I wouldn't mind getting my hands on a copy. I got to play this at Origins with the creator. Great little osr style game. Looks interesting, so many good OSR ideas out there! In again! Thank you and Merry Christmas! Looks sweet! I am in! Another awesome entry to the prize list...! Oh, oh,oh. Pick me! Pick me. Love this rule set and want to give a copy to my kids. Sounds really great! Loving this promotion! Thank you for doing this! Great item. Happy Yalda! Mithras is very OSR. Count me in, looks cool. This is a awesome quick game!